Vintage pastry plate with pink flowers. Across the flowers a female gymnast is applied. The image is screenprinted with pink glaze. Improved! 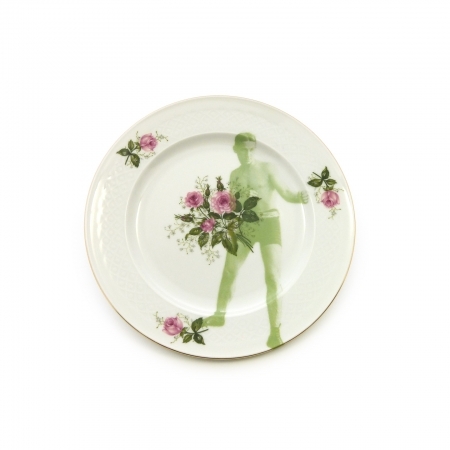 crockery is a range of one-of-a-kind plates, platters, tea- and coffeepots and other porcelain items. Every piece is gathered at the fleamarket and has it’s unique decoration. Improved! crockery is baked again in the ceramics oven and has to be washed by hand. The size of this pastry plate is 14,5 cm.